Select an item from the menu for detailed information, or visit our blog for the latest updates from us. 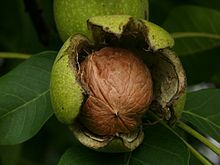 The Mega-Frut Walnut Kernels Company was established in Bulgaria in 1998. Our main activity is buying up and remaking walnuts kernels and walnuts, where we have a considerable experience and we are leader in this activity in Bulgaria. Our main office is in Shumen and our production base is in Salmanovo. Our base’s equipments are dry-machine and calibrate machine. We offer you big various of labels, packing up and paleting, accordingly to the requirements of the clients. The quality of the production is conformable to the requirements of the Europe standart (ISO). The firm is able to produce 24 – 26 tones dry walnut and 15 – 19 tones dry kernels in period of 7 days. Walnuts are a high density source of proteins, nutrients and essential fatty acids. Walnuts must be processed and stored properly. Walnuts are late to bear leaves - not until the second half of the spring. To prevent competing vegetation from growing, they also secrete chemicals into the soil, and this is why flowers or vegetables should not be planted too close to them. 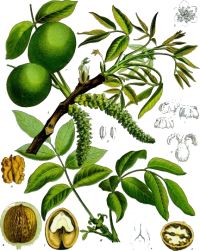 The walnut fruit is enclosed in a green inedible husk. Inside the husk, there is a wrinkly walnut shell, which has two halves. The shell encloses the kernel, which consists of two parts, separated by a partition.